With this end in view, there is no other way but to encourage farmers on the periphery of ​​King Gia Long’s Tomb to return to their rice paddy fields. 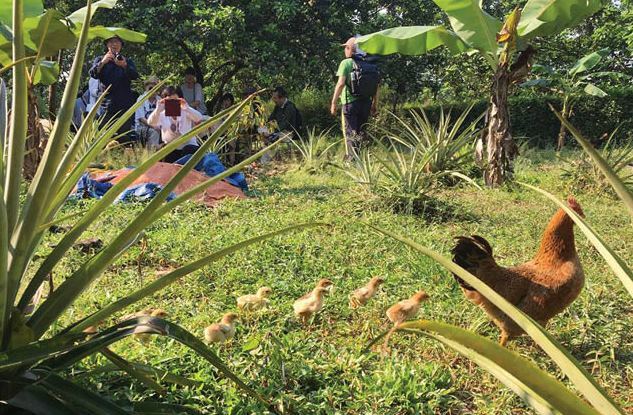 And such return is not meant to revive rice production as the main source of income for the locals, but to develop ecotourism – an idea for a pilot project of "Investigative ecotourism" to be deployed at King Gia Long's tomb. 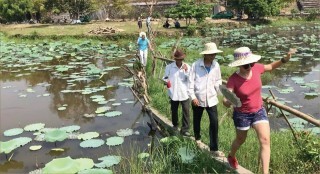 "Investigative ecotourism" at King Gia Long's tomb was first publicly introduced by architect Kawahara Susumu in March 2018, within the framework of an international conference in Hue city on the management and sustainable use of cultural landscapes and historical ecosystems in the royal tombs of the Nguyen Dynasty and the vicinity of the upper Huong River region. 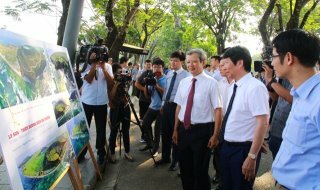 Since then, the project continues to be developed to finalize a complete tourism product. 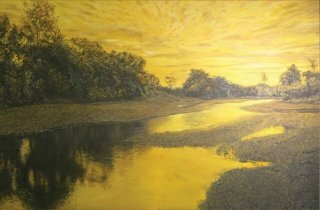 On studying the cultural landscape and the historical ecosystems at the royal tombs of the Nguyen Dynasty and the upstream area of ​​the Huong River, Japanese experts have recognized the important principle of feng shui embraced in the royal tombs of the upper area where the water system featured an environmental management system to adapt to the monsoon climate. Originally, villages and rice paddy fields in this area had existed before people engaged in nature with water irrigation and environmental management activities. Rivers and waterway systems in the royal tombs greatly supported agricultural production in the neighboring villages. However, the rapidly growing population in the vicinity of the royal tombs has directly impacted the historical monuments. The water system is not regularly maintained, and several other external factors are severely impacting the maintenance of necessary water supply for the fields. People gradually abandon rice cultivation and replacing it with other short-term industrial crops such as acacia and melaleuca that can yield quick financial benefits but negatively impact the ecological environment of the buffer zone and the original water system. This is the reason why architect Kawahara Susumu (Waseda University, Japan) proposed the project of "Investigative ecotourism" at King Gia Long's tomb in which people are encouraged to return to the fields and cultivate rice in order to restore the irrigation system that was built to support agriculture in the past. According to architect Kawahara Susumu, the royal tombs in Hue particularly blend their peripheral environment with the lives of local people. To preserve this historical legacy, the environment must be protected and maintained for later generations by connecting with life. Even the chickens can… do tourism business. As soon as the idea of ​​"Investigative Ecotourism" at King Gia Long’s Tomb was proposed, planners called for the participation of people living in Dinh Mon village (Huong Tho commune, Huong Tra town) and viewed them as the main stakeholders. 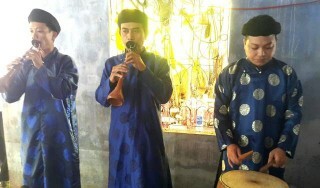 The objective of the project is to help locals to protect, use, and sustainably manage the resources of the cultural landscape in the royal tombs and the upper region of the Huong river while encouraging the communities to do tourism business for a living. 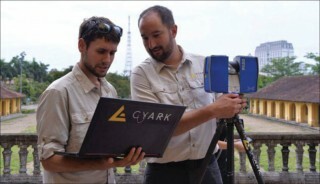 After three trials, the project of "Investigative ecotourism" in King Gia Long tomb has sought further opinions from various stakeholders and apparently received positive support from local people to authorities, tour guides, Japanese-speaking visitors, English-speaking visitors, and travel agencies… Hue Monuments Conservation Center is also working with Japanese partners to receive constructive comments from departments and agencies to secure funding sources to support local people to exploit this tourism activity in the future. 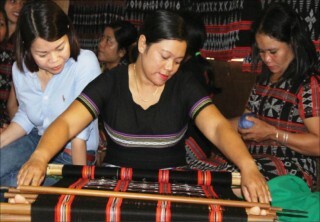 On the journey to the upper Huong River, tourists of an “Investigative Ecotour” are led by native tour guides who tell stories about their village life. Tourists can enjoy local cuisine and do sightseeing in the buffer zone before entering the heritage site. 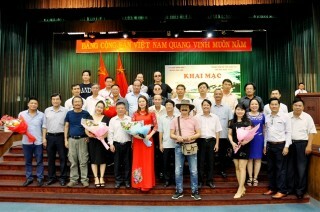 Mr. Ho Ngoc An, headman of Dinh Mon village - a very active person born in the 1980s, also felt elated at this tourism project. An is ready to change his job, support the project, and join hands to contribute to the protection of the heritage’s landscape. 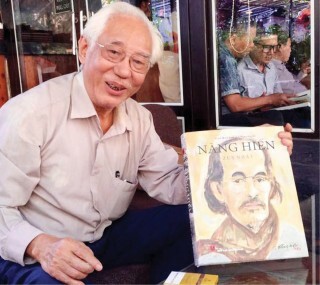 "Dinh Mon has 150 households. At first, it was very difficult gathering people to discuss the project, but now 80% of the people shows firm support and favorable attitude. Japanese experts have spent many years researching the water system in this area, and we highly appreciate their efforts and goodwill. We hope the project can be implemented soon so our people can have more job opportunities and improve their income,” said Mr. An, the village head.